After four intense days and thousands of your votes our Twitter feed, we have our Speedy 16 set up for the division semifinals beginning on Thursday. Here is the latest bracket. Day four in particular offered some significant upsets, as the two 1 seeds in the Resistance and Community division were both tossed–interesting enough, each by 9 seeds. The 1 seeds in the Mania as well as &Knuckles division remain, but Modern Sonic has a tough bout ahead in the Speedy 16 with fan favorite Shadow. One thing is for sure: A hedgehog is guaranteed to win the Mania division. The same cannot be said of foxes. With Tails, Tails Doll, and community Youtube channel Tails Channel all eliminated in the weekend matches, there will be no Tails representation in the Speedy 16. 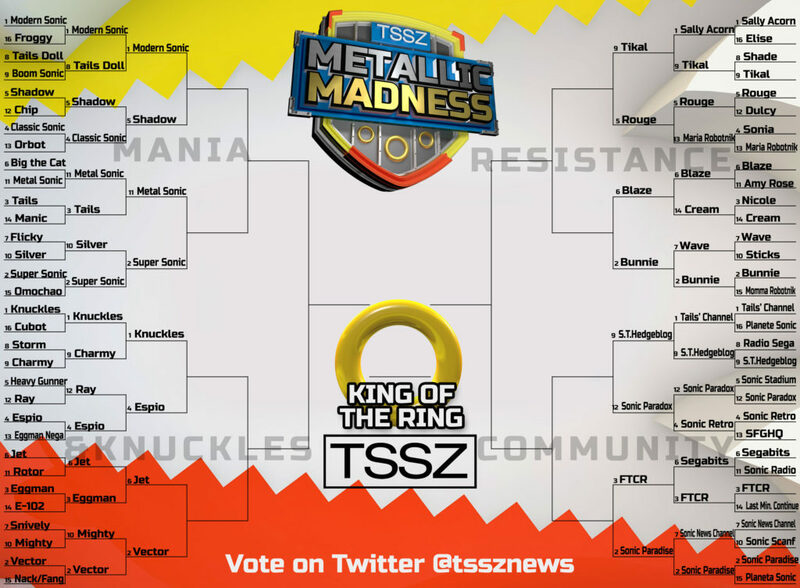 One particular match was heartbreaking; 11 seed Metal Sonic advanced with a buzzer-beating one vote victory over the two-tailed fox. Never let anyone tell you that your vote doesn’t matter. The most intriguing matches coming up appear to be Modern Sonic vs. Shadow–a clash of continuity titans sure to generate fan interest–and the Community division match between Find the Computer Room and Sonic Paradise. Paradise in particular has been excellent this tournament at rallying their followers and the Spanish Sonic community at large to keep their hopes at a Final Zone birth solid. And with defending division champion Sally Acorn now out, the Resistance division looks completely up for grabs. Here is the voting schedule for the first round of the Speedy 16, beginning Thursday at 4PM ET. Remember: Voting only takes place on our Twitter feed. Each match lasts two hours. Winners will vie for your votes again Saturday and Sunday for a spot in the Final Zone. Good luck to your favorite!